Coachella’s vibes came to Humber College in its own form called ARTchella, a student-art show put on by Lakeshore campus public relations students last Wednesday. The annual festival showcases the talent of Humber art students, and this year’s theme was inspired by the California music and arts festival, Coachellla. The displayed talent included not only art program students, but also student from fitness, food and nutrition and building technology. The showcase was divided into various categories including photography, painting and mixed media. The juries were representative teams from the League of Innovation, an international non-profit that cultivates innovation in community colleges. Veronica Sidgursdon, a public relations post-graduate student, was in charge of planning and organizing the festival. “It was great, we put it together, we had a great team of people collaborating to create the showcase,” Sidgurdson said. 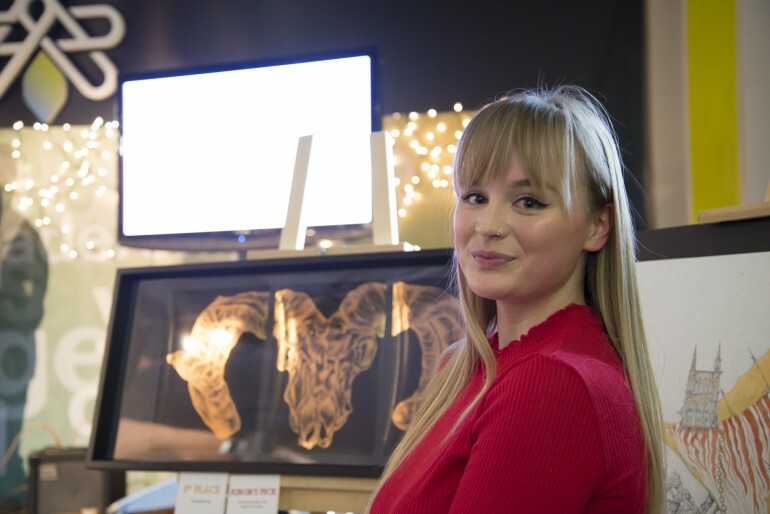 “It’s really nice to showcase all the talented artists we have at Humber, not only in the arts program but in the whole student body,” she said. Food and non-alcoholic drinks were served and live music played before winners were announced. Annette Borger-Snel, a professor and program coordinator for Humber’s Public Relations course, said she’s amazed by how well the showcase went. “Well, I’m proud of my students for hosting this event, and (they) put in a lot of work, but I’m also very proud of the artists for putting themselves in the public forum, to have their work on display and it takes bravery,” Borger-Snel said. Shannnon Pittman, a visual arts student, was the winner in the painting and drawing category. She said it was the first time she participated in this kind of event. “It’s the first time ever submitted anything,” Pittman said. “I made this for one a school project, and I thought in submitting for Artchella. Hydrah Rodriguez-Vizzaccaro, a creative photography student, won the second place in the colour or monochromatic competition for a photo of a bridge spanning snow-covered water. “I’d never been in art competition before, so I’m very excited I won the second place,” Rodriguez-Vizzaccaro said. Mikayla Labadie, a creative photography student, was awarded third place, but her work — a self-portrait influenced by the wildness of nature, African cultures and herself — was selected by the jurors to appear in an international competition. “I was very interested in different cultures, in different people that I like,” Labadie said. “The portrait supposed to be a person who lives in the woods, like a warrior in the forest with a lot of African influences,” she said.